The other night I wasn’t too hungry but wanted to create something light, yet substantial enough to sustain us through the night. 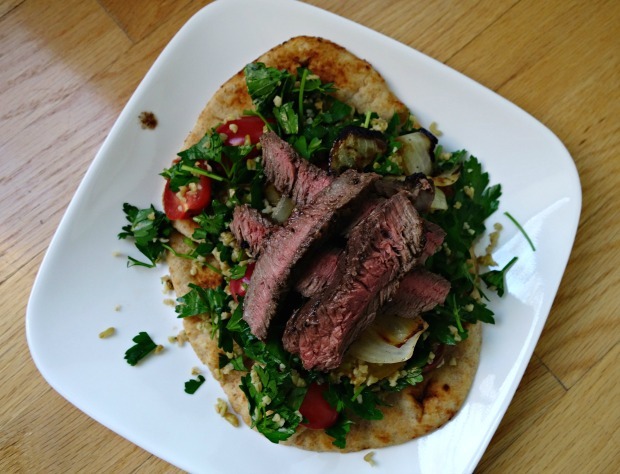 I came up with this Freekeh Tabbouleh with Lime Marinated Sirloin over Flatbread. It was perfect – light, tasty and filling, without making us feel stuffed. If you aren’t familiar with Freekeh (pronounced free-kah, sometimes called farik) it’s wheat that is harvested while young and green. It’s roasted over an open fire, then the straw and chaff are burned and rubbed off. The grain on the inside is too young and moist to burn, so what you’re left with is a firm, slightly chewy grain with a distinct flavor that’s earthy, nutty, and slightly smoky. Freekeh is considered one of the ancient grains, and because it’s high in fiber it keeps you feeling full longer, which is ideal if you’re trying to lose weight. This whole grain is full of essential nutrients such as selenium, potassium and magnesium, and like quinoa it is an excellent source of protein. I like switching up my grains and think you’ll enjoy trying Freekeh. 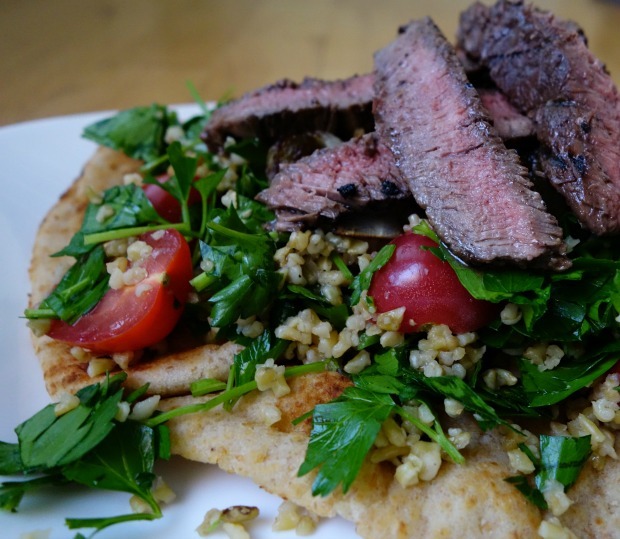 I decided I’d add my Beef Fajita recipe to top off the Tabbouleh and set it all over some flatbread. This dish is ideal for brunch, lunch, and dinner. 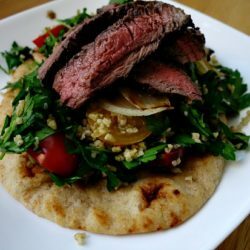 Instead of using the balsamic that I use on the onions in my Beef Fajitas, I simply grilled them with a light coating of olive oil, then added them to the Tabbouleh already dressed with lemon juice, red wine vinegar and a light drizzle of extra-virgin olive oil. This dish makes a lovely presentation if you’re serving it to guests and perfect on a nice spring or summers day. In fact, a few days ago it was in the 80s here, now it’s in the 30s and snowing – go figure! A simple light meal to keep you satisfied through the day! Beef & Marinade: Stir together lime juice, 2 tsp salt, and 2 tbsp. olive oil in a small bowl. Add steak to marinade and toss to coat. Set aside for 30 minutes to several hours to marinate in the refrigerator. Toss onions with 1 tbsp. olive oil. Tabbouleh: Place Freekeh and 2 1/2 cups of water in a saucepan and bring to a boil. Cover, reduce heat and simmer approximately 20-25 minutes. Drain, if needed, and set aside to cool. Brush cut lemons with olive oil. To Grill: Remove meat from marinade, and pat dry. Add freshly ground pepper. Grill steak 3-5 minutes per side (medium – medium/rare). Allow to rest 5 minutes, and then thinly slice on the diagonal. Grill onions in a grill basket approximately 20 minutes or until tender. Transfer to a cutting board. When cool enough to handle, chop onions into 1-inch pieces. Grill lemons, cut-side down, for 3-5 minutes until charred. Plate: Place Freekeh in a bowl with parsley, tomato, vinegar, olive oil (up to 1/4 cup), and juice from charred lemons. 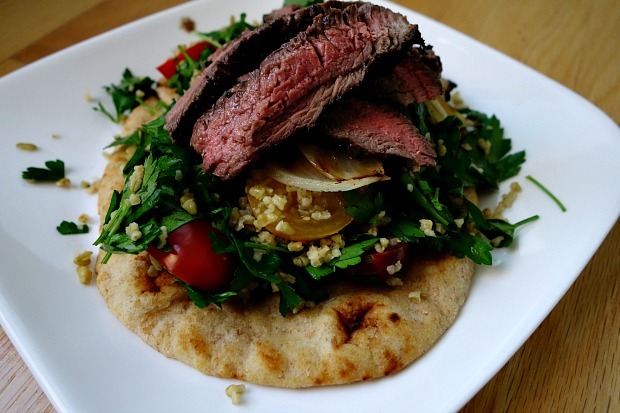 For each individual serving set a piece of flatbread on a plate, top with a mound of Tabbouleh, onions, then sliced Sirloin. Serve. Yum! This looks like my kind of dinner. I love everything about it Vickie! What a glorious gourmet meal! I love the plating too, Vicki. I’ve done virtually nothing with Freeheh. Really need to get cracking with it! And this would be a perfect gateway recipe — such a lovely mix of flavors and textures. Plus it’s an entire meal! Really nice — thanks. Hi vicki, this is my ideal meal, love the chewiness and flavor of freekeh. Never knew about freekah before. The meal look so healthy and packed with flavor. What a perfect salad! So simple and so much flavor. Love the idea of serving this salad on top of flatbread. I’m definitely going to steal that idea and make this salad. I see that this was from a while back but it looks so good to me that I had to chime in! I keep hearing about freekeh (and love writing it) but haven’t tried it yet.